I made it through an entire Girl Scout cookie season without eating one Girl Scout cookie. Some may see this as a tragedy, but I view it see it as a success, as Girl Scout cookie season came during the last weeks of my Half Ironman triathlon training. Samoas have always been my favorite Girl Scout cookies (although they are not the most cost effective. Only 14 Samoas in a box compared to 40 Thin Mints!). I came across this recipe for Samoa Mascarpone Cheesecake. Elyse (love the name...maybe that's because my name is Elise too!) 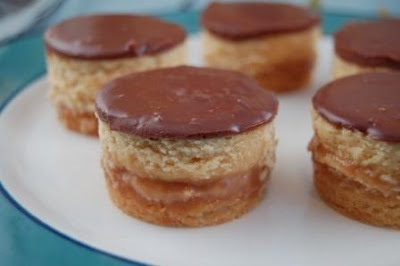 from Elyse's Confectionery Creations came up with this recipe for a Samoa-inspired dessert. She just made it up. Talk about talented! These aren't quite cupcakes, but they are mini desserts so they qualify for my blog. And boy do they look delicious!! Now I just need a few hours of free time so I can try them out. Please make these and then invite us over. They look like the best thing ever! ooh, they look yummy! 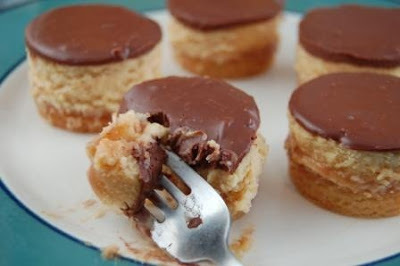 i made some samoa cuppies a couple months ago ...very fun! Dave- I think I will. Although, I think these cheesecakes will require almost as much work as your Irish car bombs. Lisa- I'm glad you liked SusieCakes. Their cupcakes are so good! I heard their red velvet is the best, but I haven't tried it yet. I've never eaten a cold Bristol Farms cupcake. I usually take them home and eat there, so I haven't seen that icing problem. I didn't know that refrigerating cupcakes made them dry. Good to know!